Triple Action Blood Pressure provides day-and-night nutritional support for healthy blood pressure levels already within the normal range. Our formula delivers flavonoid and glycoside compounds in two separate tablets one taken in the morning, and the other, which contains melatonin, at night for constant vascular health and blood pressure support. Blood pressure readings have a circadian rhythm and vary greatly depending on whether you're awake or asleep. 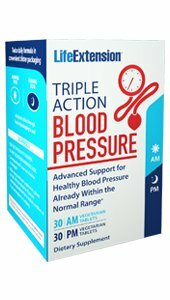 Triple Action Blood Pressure is a twice-daily nutritional supplement that addresses both nocturnal and diurnal blood pressure health. Each AM tablet of Triple Action Blood Pressure contains quercetin, myricitrin, and myricetin flavonoids. Evidence indicates that these phytonutrient compounds support healthy vascular function and promote healthy blood pressure levels already within the normal range through a variety of mechanisms. Each AM dose also contains stevioside, a glycoside molecule derived from the Stevia rebaudiana plant. Stevioside also promotes healthy blood pressure levels already within the normal range in pre clinical and clinical studies. Our formula's PM dose tablet contains the same phytonutrients as the daytime tablet, plus 2 mg of timed-release melatonin. Also known as the "sleep hormone", melatonin is primarily synthetized at night by the pineal gland in the brain and promotes healthy, restful sleep. Melatonin also promotes healthy blood pressure levels already within the normal range a benefit for which timed-release melatonin has been shown to be particularly effective. Triple Action Blood Pressure provides a novel approach to promoting blood pressure health while you're awake, as well as while you're asleep. DIRECTIONS: Take one (1) AM tablet in the morning and one (1) PM tablet 30-60 minutes before bed, with or without food, or as recommended by a healthcare practitioner.